Real-Life Spider-Man Scales Building and Rescues Child: WATCH! Mamoudou Gassama is a freaking hero. In fact, he's being compared to one fictional superhero in particular for his very real heroic deed. With a child dangling off of a balcony, he took action and raced up the building — by climbing its exterior. His extraordinary actions saved the child. And his good deed is not going unrewarded. Mamoudou Gassama is 22 years old. He is an undocumented Malian immigrant to France. On Saturday afternoon, he became famous for the best of reasons. 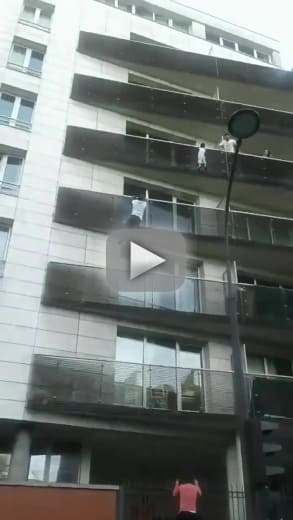 In under 40 seconds, he scaled the facade of a Parisian building to rescue a small child, who was hanging on for dear life from the fifth floor balcony. This is a feat that many have hailed as superhuman, and some have likened him to the Marvel superhero, Spider-Man. But Mamadou is a human, and his actions show not only the potential of the human body, but the motivations of human compassion for total strangers. In under a minute, mamadou had lifted the 4-year-old child to the safety of the balcony. The crowd thta watched Mamoudou climb was impressed. And within hours, the video of his heroics had racked up millions of views. "Congratulations to him for his bravery that saved the life of a child last night. I was pleased to speak with him today by telephone, in order to thank him warmly." "He explained to me that he had arrived from Mali a few months ago, dreaming of building his life here." Her reply commended him for his wonderful works. "I replied that his heroic gesture is an example for all citizens and that the city of Paris will obviously be committed to supporting it in its efforts to establish itself in France." Hidalgo was not the only French politician to take note of his selfless act. French President Emmanuel Macron invited Mamoudou to meet with him. "I just didn't have time to think, I ran across the road to go and save him," Gassama told Macron during their sit-down. He credits his faith for giving him the strength to scale the building. "I just climbed up and thank God, God helped me." He says that, as he went up, his confidence increased. "The more I climbed the more I had the courage to climb up higher, that's it." Those are humble words from a compassionate man. "You saved a child. Without you, no one knows what would have become of him." Probably nothing good, though we would point out that others were trying to help. "You need courage and the capability to do that." Macron gave Mamoudou a medal and certificate for his bravery. He also offered him French citizenship — and a job with Paris fire brigade. Mamoudou transformed too lives that day — stopping one life from ending at 4, and making his dream of a new life in France into a reality. As you can imagine, people have some serious questions about how a 4-year-old child could be left to dangle from a balcony like this in the first place. The boy's mother was not in Paris at the time. Police have questioned the boy's father over why exactly he left his 4-year-old unattended. Roseanne Barr on Valerie Jarrett: I Thought the B-tch Was White! Frances Bean Cobain: Ex-Husband Coming After Her Kurt Cash?! Previous story The Bachelorette 2018 Preview: Love! Tears! Pathological Liars!